Oh my gosh, wow. Just wow. Dan Wagstaff from Raincoast Books told me Jo Walton’s Among Others is “totally a novel for book nerds,” and wow, is it ever! If a book has ever changed your life, if you’ve ever felt at home in a new town because of the local library, if your favourite book has ever made a troubling experience easier to bear — read this book. Among Others is a story about magic; it’s about boarding schools and dealing with grief; above all, it’s a love letter to books and libraries, and to the community created by book lovers finding each other. I haven’t underlined a book this much in a long time — now my copy is filled with passages underlined in green ink, and I can imagine it soon becoming dog-eared and tattered from much re-reading. It’s that good. Dear Dan Wagstaff: thank you! Mori Phelps was raised in Wales by an insane mother who dabbled in magic. Mori finds refuge in science fiction novels and the fairies who live in nearby industrial ruins. When a magical battle against her mother kills Mori’s twin sister and leaves Mori crippled, she runs away to join her father in England. Her father sends her to boarding school, where she attempts some magic of her own to find friends, and eventually has to face her mother again. You can almost always find chains of coincidence to disprove magic. That’s because it doesn’t happen the way it does in books. It makes those chains of coincidence. That’s what it is. It’s like if you snapped your fingers and produced a rose but it was because someone on an aeroplane had dropped a rose at just the right time for it to land in your hand. There was a real person and a real aeroplane and a real rose, but that doesn’t mean the reason you have the rose in your hand isn’t because you did the magic. I love that. I love the ambiguity about the idea of magic. I love how you can never be sure if something magical really was going on, or if it was Mori’s science fiction-fuelled imagination casting events in a magical light. Even the magical battle against her mother is never fully explained, and the sister’s death could very well have been the result of an accident. Yet, as with the rose and the aeroplane, just because there was a real accident didn’t mean it wasn’t magic. I love this ambiguity because Among Others refuses to be about actual, fantasy world magic or about finding magic in the ordinary. Rather, Among Others remains firmly within the possibility of magic, and, as any reader can attest, potential can be so much more potent than the actual. Take for example a scene when Mori is asked whether her fairies could be ghosts and she replies she doesn’t know. “Don’t you want to find out?” he asked, his eyes gleaming. That’s the spirit of science fiction. “Yes,” I said, but I didn’t really mean it. They are what they are, that’s all. Like Mori, I too didn’t want her magic to be tied down to a single explanation. As such, I found it really jarring when Mori says, “Does this mean that it doesn’t matter if it’s magic or not, anything you do has power and consequences and affects other people?” No, I wanted to shout. No shift into self-awareness and definitely no tying down into moral lessons. Fortunately, Mori concludes that “magic is different,” and I try to forget that that all too preachy line was ever written. I want to say that at its heart, Among Others is really just about a lonely young girl grieving over her sister’s death and trying to belong to a new school. There’s a particularly beautiful passage where Mori realizes she’s fifteen and her twin “is still and always fourteen.” Yet the book defies such reductionism. The book is eloquent in its simplicity, yet it also feels expansive in scope. “Sometimes I’m not sure whether I’m entirely human,” Mori confesses. I mean, I know I am… What I mean is, when I look at other people, other girls in school, and see what they like and what they’re happy with and what they want, I don’t feel as if I’m part of their species. Something about the way Mori speaks takes the very personal emotion of loneliness and makes it seem like an intergalactic issue. I love her narrative voice, possibly because I’m a major nerd, and such metaphors resonate with me. At one point, Mori considers joining her sister — again, described in such a way that it’s not about suicide, but about following her sister and some fairies into a portal, much like the one elves go to in Lord of the Rings when they die. Mori decides against it because she still hasn’t finished Babel 17. “I’m sure that isn’t normal,” she admits. Still, “there may be stranger reasons for being alive.” I love Mori’s detached, almost clinical tone about such an emotionally charged scene; you can just feel her disengaging from the pain and trying to find refuge through words. The ambiguity over magic has its own consequences for Mori. She casts a spell to find herself a karass, and it works. If, like me, you haven’t read Cat’s Cradle by Vonnegut, Mori describes a karass as “a group of people who are generally connected together.” Essentially, she uses magic to find herself a group of friends, and the next day, she hears about a science fiction book club at the local library. Coincidence or magic? The difference matters to Mori — do her new friends like her for herself, or is it the magic that made them like her? Her confusion and fear that perhaps without her spell, her newfound friends wouldn’t have liked her are very real. That’s another thing I love about Among Others. Even when phrased in magical terms, or described in a fantastical way, Mori’s emotions feel very real and keep the story firmly grounded. I’ve mentioned that Among Others is a love letter to libraries and a novel for book nerds. Mori feels she can handle her new life with her father because of his library: “I have books, new books, and I can bear anything as long as there are books.” She also finds refuge in the local library: “Libraries really are wonderful… I mean bookshops make a profit on selling you books, but libraries just sit there lending you books quietly out of the goodness of their hearts.” Isn’t that a lovely thought? Mori also references a lot of books. At times, I felt like the school librarian who took Mori to a book club meeting on Le Guin and, having read only Wizard of Earthsea, felt intimidated by the pile of books on the table. Mori uses terms like karass without bothering to explain them and mentions characters from science fiction novels without bothering to explain their stories, because to her, these words and names are familiar. Context usually made it fairly easy to guess the meaning of unfamiliar words, and I admit feeling a thrill of recognition at the ones I did recognize. When Mori compares Marx’s Communist Manifesto to Anarres, I love the way it made me suddenly think of communism in a new way. When a Wikipedia search showed me that the name for Mori’s fairy friend Glorfindel actually comes from Lord of the Rings, I thought that was just geeky cool. The best part is that all the references to science fiction in Among Others gave me a full list of books I now want to check out. Mori’s love for these books is irresistibly infectious. “The thing about Tolkien,” Mori says, “about The Lord of the Rings, is that it’s perfect.” Yes! Oh my god, yes! She talks a lot about Samuel Delany’s Triton, and at one point compares it to one of my favourite novels, Ursula Le Guin’s The Dispossessed. Literally, while I was still reading Among Others, I checked to see if Triton is available at my local library. It isn’t, but I did find it at a nearby indie used bookstore. I just bought it this weekend, and can’t wait to begin it. Seriously, Among Others is just that kind of book. You finish it and want to keep reading more. You want to read all the books Mori mentions and understand exactly who Glorfindel is. You want to cast your own spell and find a club at your local library that loves reading as much as you do. Mori’s passion for books and desire to find fellow book lovers with whom to share that passion invites us to join in her karass. Trust me: read this book. If you do, I’d love to know what you think! I discovered Among Others myself from a Twitter conversation where the tweeters were so enamoured of the book that I just had to read it to see what the fuss was all about. I’m so happy I did. 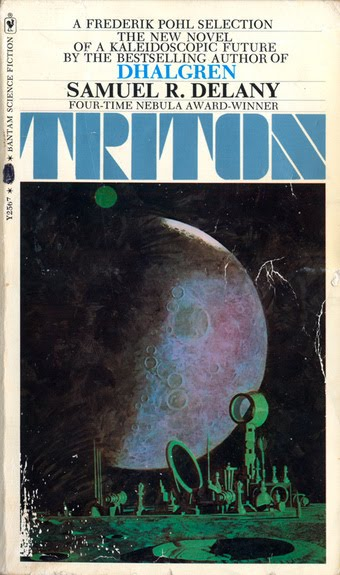 Now, if you’ll excuse me, I’m off to read my brand new (used) copy of Triton. This entry was posted in Book Reviews and tagged 50BookPledge2012, Fiction, Raincoast Books, Science Fiction by Jaclyn. Bookmark the permalink.